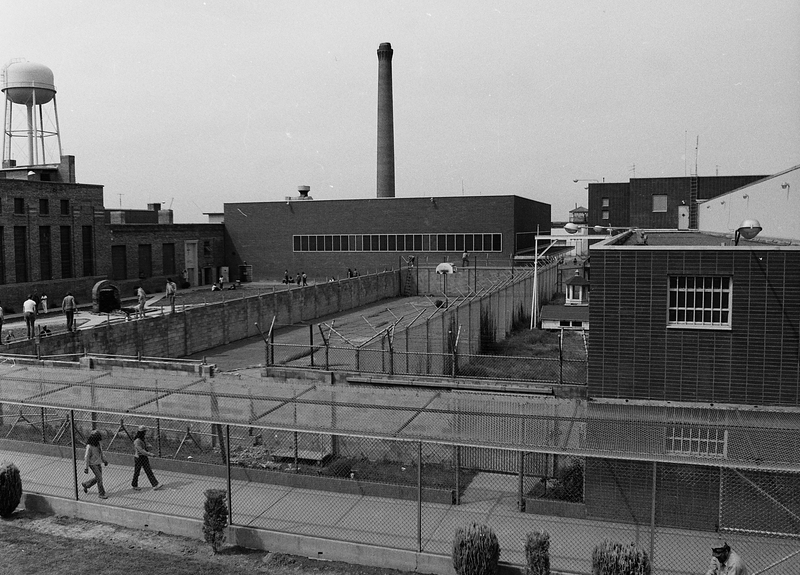 This picture, from sometime around 1977, shows the old segregation yard in the middle of the prison. Big Red (segregation) is on the right, the dining halls are in the center, and the chapel and seven wing are on the left. The open space between seven wing and the seg yard is People’s Park. The proximity of People’s Park to the seg yard made it easy for inmates in segregation to communicate with inmates in People’s Park or for contraband to be thrown over the wall. When Douglas Vinzant was superintendent, he gave the Lifer’s Construction Crew sledgehammers and had them tear down the seg yard. This eliminated one of the many avenues for introducing contraband into seg but it also effectively ended outdoor recreation for inmates in segregation. People’s Park became much bigger.